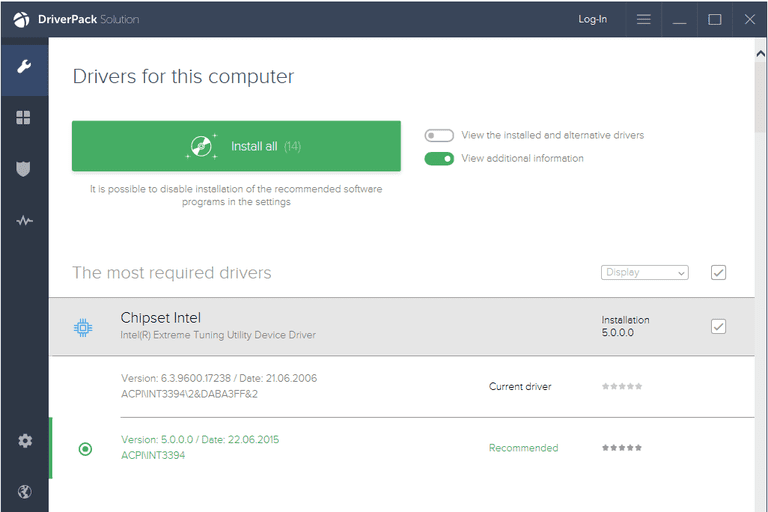 DriverPack Solution is a free driver updater tool that, with just a few clicks, finds the proper device drivers your computer needs and then downloads and installs them for you — no clicking through any wizards or installation prompts. Because DriverPack Solution is so easy to use and free from the clutter that similar programs have, there are also some features you won't find in this tool. This review is of DriverPack Solution version 17.10.4. Please let me know if there are newer versions I need to review. The website lets you download specific sets of drivers in a 7Z file, like chipset, Bluetooth, sound, video, etc. Once you've downloaded, say, Bluetooth drivers, the 7Z archive has separate folders for different manufacturers like Logitech, Motorola, Realtek, Broadcom, etc. DriverPack Solution is a great option if you're not familiar or interested in all the backup/restore options and other settings and screens that some similar driver updates have. If a minimal driver updater program is something you're interested in, then definitely give this one a shot. However, I find that it sometimes takes awhile to download drivers — longer than what I've seen in similar tools that update drivers. DriverPack Solution is also wonderful if you want to update the drivers on a computer that doesn't have an internet connection. There's an offline version you can get that includes all the drivers offered by this tool, which you can then transfer over to the computer that needs it (like on an external hard drive). Another option is to just get the network driver you need and then download all the drivers normally from that point forward.